This is why I prefer to commute by bike when I can. Living in Zone 2 is great for getting home late at night but the commute to work in the morning is not as much fun. The 07:40 is generally the last train you can be sure of getting on but not this Monday. 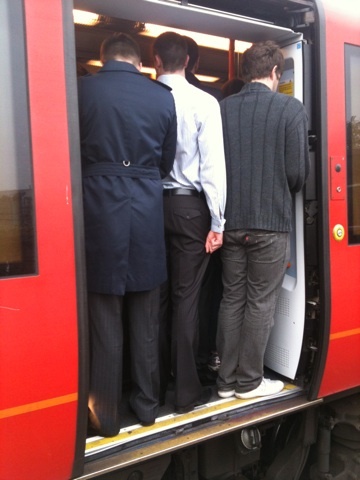 From 07:47 onwards you are often have to let one or two trains go before you can squeeze on. 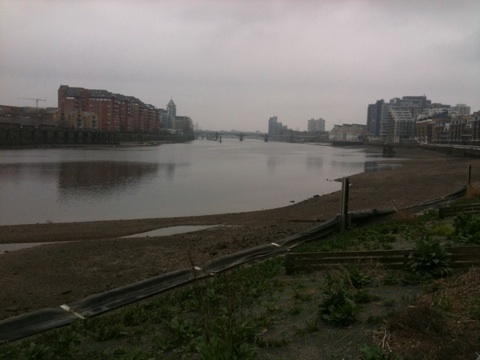 The Thameside path is a different matter - no crowds here - and the river's ever changing moods. One day gray with the tide out, another day sunny and the tide is high (cue song). Maybe I should take a series of photos from the same spot to illustrate - no matter - the point is that it is quicker to cycle to work than take the train (seriously), cheaper than the gym (saves me money) and you are there in the moment - no slug-like dozing on the train but all senses alert for the traffic around you - that wakes you up for the day! I had to show my husband the pic of the train at 7.40 because he just told me there is no way in hell he is living near the wandsworth town rail station to depend on commuting. I was trying to convince him otherwise, but ran into your photo and started cracking up. He was right, and I'm down a point on credibility. Thanks for that! Wandsworth town is a fantastic place to live. The trains in the morning are very busy though. I'm glad they will soon add longer and more frequent trains to Waterloo.